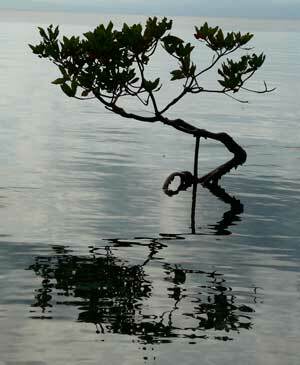 A pioneer Rhizophora mangle, aka “Luc’s tree”, growing in the shallows off Twin Cays, Belize. eXtreme plants is intended as a dynamic web space, presenting the world of plants exquisitely adapted to marginal habitats to the world at large as well as to devoted researchers. Because the research community has both unifying and diverse interests, and because there are, in fact, only small numbers of folks working on any of the potential model systems, it is our hope that the site will encourage communications and collaborations among scientists and bring broader focus on the potential of, and dangers facing, eXtremophytes. In this space and at this time, we will focus most on experimental model systems that have resources available at the cellular and molecular levels. We will provide sometimes extensive “backstories” on major model species and research surrounding them. In doing so, we will, perhaps unfortunately but unavoidably, concentrate on more “recent” studies at the expense of eXtremely valuable but older ones. When possible, we will use photo galleries to show the species in their ecological contexts. We will provide links to research resources, such as genome sequences, databases, funding resources and upcoming events. And we will highlight publications with the potential of having particularly high impact on the field, and topics of interest not only to researchers but to the general public. At this point, we encourage you to sign up for the x-list so you can receive or post notices of upcoming events, job openings, courses etc. You can, of course, unsubscribe at any time. Through this list, we will keep you informed as the site develops and expands. Most importantly, you can contribute! It really will be difficult or impossible for us to find all the relevant work – all your important work – without your help. So please, us if you have something to offer, or wish to comment on anything you read. Acknowledgements: The impetus for development of the site was discussions at an ISF-BIDR workshop on “Surviving the Extremes” at Ben Gurion University of the Negev in 2015. Specifics were subsequently worked out by Simon Barak (BGU) and John Cheeseman (Illinois). Most of the actual writing has been done by John Cheeseman to whom complaints should be addressed. Credit (and thanks) for realization of the site go to atc at Birdhive Development and Design.